DISTANCE FROM TOWN CENTRE: 25 minutes on ferry from downtown. Check Fullers Timetable. EXACT LOCATION: The run starts and finishes at the wharf on Rangitoto – straight off the ferry and on to the trail! DEFINING CHARACTERISTICS: Harsh, volcanic scoria is the base of the trails – take tough shoes. It can be very hot in summer so carry plenty of fluid. Trail varies from well made path and boardwalk to technical & rocky (especially on Coastal Track section). Stunning views from the top of the island are a great reward. FEATURES OF INTEREST: You are going to the top of a volcano that erupted from the sea only about 600 years ago – it is a special and unique place. Download the informative DOC brochure for more background. ONLINE REFERENCE: See the run in detail via Running Wild’s Garmin Connect page. BEST MAP/S: No topo map required. This simple DOC map will suffice. RUN IT: Just a hundred metres from the wharf you will pick up the Summit Track (signposted sensibly enough to ‘Rangitoto Summit’). Follow this up the gradually steepening side of the volcano, ignoring the left turns to Kidney Fern Glen and Wilson’s Park Track. After about 2 kms you’ll reach a bit of a clearing. Carry straight on following the steps on the Rangitoto Summit track. Another 300m of lovely bush running brings you to the Crater Rim Track. 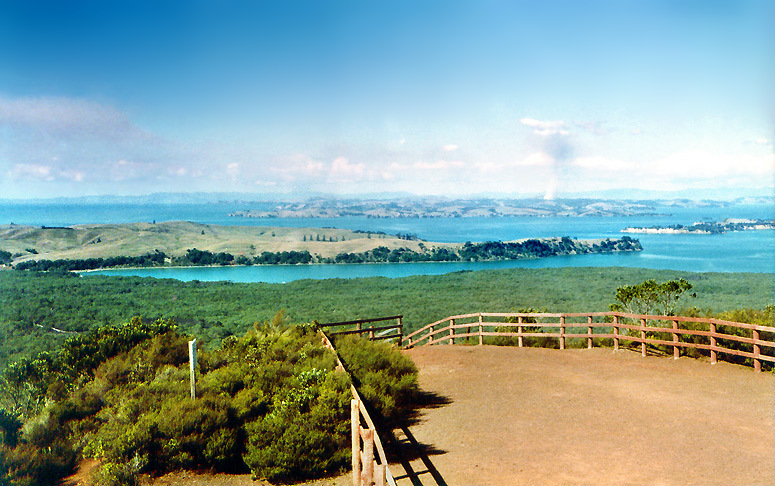 Turn sharp left up the boardwalk to the summit trig and stupendous 360° views across the harbour and the Hauraki Gulf. Exit the summit area on the far side via the Crater Rim Track and follow a short distance until a wide track heads off downhill to your left. Follow this and very soon turn left on to Summit Road. Follow this downhill for about 200m before turning left on to Wilson’s Park Track. This is a beautiful stretch of single track that sidles around the side of the hill before rejoining the Summit Track in about 1.3 kms. Turn left on the Summit Track and re-trace your earlier steps up the hill to the clearing. This time leave the clearing to the right following the sign to ‘Rangitoto Summit via Road’ and ‘Lava Caves’. Keep a careful eye out for a junction after a couple of hundred metres. Straight ahead is a worthwhile dead-end detour to the lava caves (take a headlamp if you want to go exploring) and a left turn follows a track around under the summit cone to join Summit Road. On hitting Summit Road turn left and follow it up the hill for a few hundred metres before turning left on the boardwalk signposted ‘Rangitoto Summit 30 mins’. This is a beautiful stretch of uphill running with great views east over the neighbouring islands and the Gulf. After about 400m you will find yourself back at the Summit Track/Crater Rim Track junction – head straight on up the boardwalk to summit for the second time. Leave the summit by the same route as before and once again take a left turn off Crater Rim Track to rejoin the Summit Road. This time turn right on Summit Road and follow this rocky road down the hill for almost 3 kms. En route you need to bear left at a junction following the sign to Islington Bay Wharf (a right turn following the sign to Rangitoto Wharf provides a less interesting short cut back to the ferry if you are running short of time or energy). When almost back at sea level turn right at a sign to Yankee Wharf, from where you will pick up the rugged and rocky Coastal Track that carries you the remaining 5 kms back to the wharf and hopefully a waiting ferry. POST RUN GOODNESS: There are no refreshments on the island but the ferry sells a reasonable range of sandwiches, snack foods and drinks. Looks great! I remember doing a Tuesday evening after-work run in summer there with a whole group of people. A ferry was charted and everyone did there own route from a short walk to an around the island run and over the summit. It finished at the jetty near where Rangitoto joins Motutapu (the ferry had cruised to here to meet us) and some of us had a refreshing swim. We then wandered over to Motutapu Island for a dusk dinner before heading back to the ferry and downtown Auckland. Nice memory and worth repeating.